A great gaming headset that will serve you well whatever you’re into, consistently presenting your ears with quality sound while also being good enough in performance and design to compete as your everyday headphones. We all know, and in many cases love, Razer’s gaming tech, and its headsets have become some of our favorites. The Pro V2 headset, for example, has long been our top pick and has the balance of performance, design, cost and features pretty much bang on. 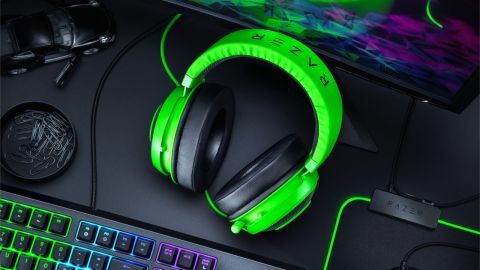 However, there’s a new generation of Kraken headset now, with one that’s simply called the ‘Razer Kraken’ representing the latest in the range. The release came recently and is supposed to streamline all the good bits of its predecessors into one similarly priced, but more-than capable, unit. Straight out of the box, and even on the box, it does look like the Pro V2. Which is fine: it’s that recognisable design and color scheme that Razer has established and its immediately recognisable. This is mixed with the same design and build quality we’ve seen before and the aesthetic is just as cool as previous iterations of the headset. The two main parts of the headset - the headband and the semi open ear cups - come together very pleasingly creating a smashing overarching design. Teamed with the design, there is a familiar feeling of solidity to the headset - but one that doesn’t come in weighing an awful lot (only around 10.5 ozs/300 grams) - giving you confidence that the Kraken would probably survive a few accidents. The headband has more padding than before increasing comfort and the clicks to resize the headband to your head are satisfying and feel sturdy. The Kraken is light on features. There are no buttons or switches attached directly to the headset, and the audio and build quality does the majority of the Kraken’s talking. Down from the headset, on the cable, there’s a small control box which does have some buttons but these are still kept limited and simple: only a volume wheel and mic on/off switch are present. A point to remember here is that the volume dial does raise or decrease all the audio you’re presented with - there’s no choosing between game or chat audio - so it might take a short while to find your sweet spot. The cable is an audio jack connection so you’ll be sorted however you setup but there is a splitter if your gaming device or PC requires the mic and headphones to be inputted separately. Lastly, the exceedingly compact and retractable microphone is present in a Kraken headset. It’s incredibly neat and easy to use with the extension and retraction function, which itself means that the transition between gaming headset and regular headphones is simple. I was told that sound from my game and chat did seep out from the headset a little to the outside, and while there’s no noise-cancelling tech to speak of, the ear cups did a good enough job of that themselves. Overall in terms of features, for a near $80/£70 headset I think they’re a bit light, certainly when you compare the Kraken to its competitors that have things such as party audio vs game audio adjuster or audio boosts of some kind. Testing the Kraken headset rigorously in games is a must, so here’s how it performed. A whole morning’s worth of Wolfenstein 2 was really fun, and the Kraken was comfortable and performed very well. To elaborate, some sounds when just walking around, previously inaudible, where now audible, and the dialogue and movie-like cutscenes were very clear and had good depth. The surround sound was a highlight as no matter what spaces I was navigating or buildings I was cowering in the corners of, I could always tell where Nazis and their gunfire was coming from. Turning to Doom, I found that the Kraken excelled equally well with a pacey, booming metal soundtrack and the ubiquitous bass-heavy noises of the game. Turning to something entirely different to broaden the horizon and test, I played some Titan Quest - an older, hack-and-slash RPG - which has a lighter, more treble-heavy soundtrack. The sound quality was still high hear, though not as rich as it was with the lower end of the spectrum. Next I continued being terrible at Apex Legends, handicapping my friends in online play to ensure I gave the mic and multiplayer gaming a test as well as the surround sound. The surround sound was great and helped me pinpoint enemy locations and even dictated how we approached a near-encounter - though the inevitable defeat happened soon after, it was not the Kraken’s fault. The microphone made me clear as day to my friends, though perhaps with not as much richness or range as in other mics. However, it's worth noting here that due to there not being a balancing act between party and game audio, when all three of us were reacting or talking, and the game had sounds coming out too, there was a cacophony of noise that I couldn't easily distinguish between. It was either turn everything down or nothing (aside from spending a while with the in-game audio, but then you may lose your edge in game). Using the Kraken as my commute headphones for a couple of days, the it proved competent in other media like radio and music. The radio was perhaps slightly less good as its a thinner sound, but music (particularly rock, metal and bass-heavy tunes) was presented very well indeed. As with radio, there was a similar experience with TV and film and their dialogue scenes (which sounded hollow), but if you wanted to keep your headset on and watch TV directly after a gaming session then the Kraken would certainly serve you fine. Comfort-wise, the padding hugs the contours of your head and ears, reacting adequately when rearranged. I had a slight ache - though nothing too unfamiliar from any other headset I’ve tested - on the bottom of my ears after long sessions but nothing else notable. This iteration of the Razer Kraken is a very competent and comfortable headset that will serve you whatever you use it for. As I expected before picking it up, it does games very well, other media pretty well, and has a simple loadout in terms of features, though it won’t quite be able to match the sound quality and features you’d get with something a bit higher in price.